Try these 7 ways to experience cherry blossoms with all your senses. Most people are familiar with the fun and frivolity of blossom viewing parties, usually involving getting merry with friends in the park, pink Asahi beer cans in hand, as falling petals dapple picnic blankets. While these parties are certainly entertaining, there are also many aspects of the cherry blossom that can’t be appreciated by looking alone. To help you dive into the world of this iconic bloom, we’ve gathered our top picks for experiencing all the dimensions of the cherry blossom. Dare to abandon the cliché this spring, immerse yourself, and be rewarded with memories that linger in your senses long after the last petals fall. Get hands on with the iconic art of cultivating miniature trees – including cherry blossoms – in this private Bonsai workshop. Fear not if you’re a houseplant serial killer. Our master will teach you everything you need to know to ensure your very own mini-sakura lives a long and happy life. The flowers do only last a week or so before gracefully bowing out, but that makes them all the more precious. 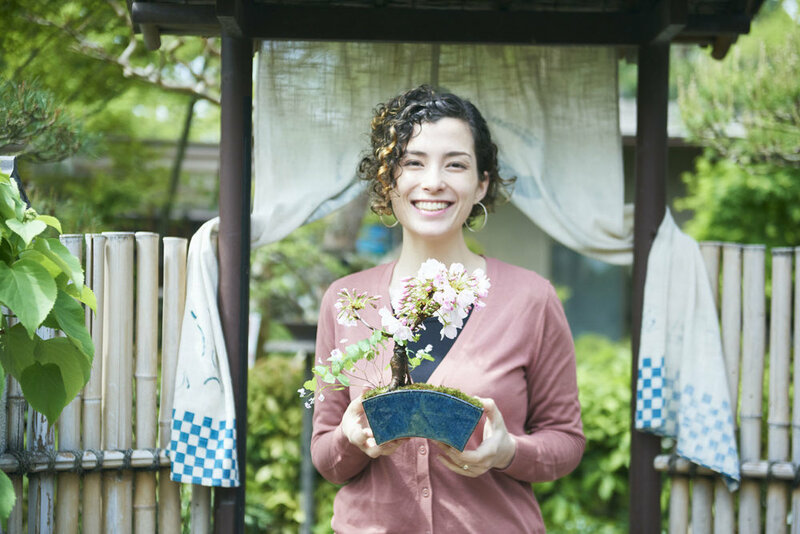 Located in the renowned Omiya Bonsai Village, this is one of the most authentic workshops in Tokyo hosted by a true master. Challenge yourself to slow down with this meditative gardening, and enjoy cherry blossoms in your home for years to come. If you can’t take your bonsai on the road with you, we’ll donate it to a charitable cause. Nothing says spring more than fresh flowers, and the woody branches of cherry blossoms make them perfect for the geometry of sougetsu-style Ikebana. Learn the fundamentals of this simple yet stunningly harmonic arrangement as you create under the guidance of master Korin. You’ll get to keep your masterpiece and enjoy the elegant presence and poise of sakura in your home. We also offer this workshop at guest hotels. Simply email us at info@detouur.com to arrange a session. While there is no shortage of ‘sakura flavored’ treats in springtime Japan, they’re often just simply pink colored or artificially flavored. In stunning contrast to these syrupy and harsh flavored concoctions is sakura tofu, a delicate savory dish prepared with salt-pickled sakura flowers. Called 'sakura no shiozuke' these preserved sakura flowers are an auspicious food, often used as a garnish for dishes, or in teas at weddings. With Masao-san, a Buddhist priest-Shojin Ryori chef, learn how to incorporate these all-natural salt-preserved sakura into a tofu dish with traditional Buddhist vegan cooking, at an ornate temple! Unsure about eating actual sakura flowers? You'll be in awe at how the delicious and fleeting flavor echoes the transient allure of these blooms. The beauty of geisha, Japan's iconic entertainers, is of mythical renown. It's not just their distinctive porcelain-white skin and vermillion lips that create their allure, but their exquisite and seasonally-attuned attire. Wearing kimonos and hair ornaments displaying the upcoming micro-season's flowers, they are walking canvases of art that build anticipation for nature's next offerings. In this current season, one step before the full-bloom of sakura, many maiko and geisha adorn themselves with sakura 'kanzashi' hair ornaments and kimonos with sakura motifs. Seasonal flora make for the perfect accent in washi, the luminous Japanese paper made from the mulberry plant. This spring, immortalize your sakura memories by handmaking washi paper with real sakura petals, picked from the studio’s cherry blossom trees! This traditional paper is made from local mulberry plants grown by Hiroko the washi artisan herself, in the quiet forests of Saitama. The combination of pure water from a nearby river with the plants creates a beautifully organic product. Arrange freshly bloomed sakura petals on the washi paper and await the finished product. This handmade paper, imbued with the poetry of spring in Japan, is the best material to use to write letters to your loved ones! Channel your inner geisha and make your own sakura hair sticks with 'tsumami zaiku', Japan’s “pinching craft”. These ornamental blossoms are made from small squares of silk, which are manipulated and folded, much like origami, to resemble seasonal flowers. The hair-sticks, called 'kanzashi' are worn by geisha, Japan's gorgeous entertainers, as well as by kimono-clad women at happy occasions, like weddings and festivals. For a limited time, sakura 'tsumami-zaiku' are being offered now! What better way to welcome spring and enjoy this sakura-season by making your own delicate sakura hair ornament in Kyoto. Your teacher, a multi-generation tsumami-zaiku artisan, will carefully show you how to recreate Japan's iconic blossoms, in the peaceful setting of a traditional Japanese house in Kyoto. Refresh your body and soul this spring with Japan's tea ceremony, featuring sakura wagashi. Japan's tea ceremony is a ritual about mindfully appreciating the present moment, an experience enhanced by the incorporation of the most seasonal flora, through flower arrangements and the wagashi sweets served. The sakura infused sweets and the delicious bitterness of the tea in this limited-time tea ceremony in Kyoto will reawaken your senses and prepare you for the beauty of spring in Japan. PS. For our Tokyo tea ceremony experience, see here. If you want to learn to make Wagashi yourself, check out our Kyoto workshop here. Want to do try something else with cherry blossoms? Ask our team below!